When the totality of the anecdotal and medical evidence is combined with: • The peer review by Dr. Samira Alaani, and over 100 more peer reviewed reports • The email exchange between nuclear physicist Dr. Christopher Busby and myself • Numerous peer reviewed reports by Dr. Busby proving the use of enriched uranium weapons in Bosnia, Montenegro, Yemen, Iraq, Gaza, Lebanon, Kosovo and other countries • The prescient analysis by Dr. Jeff Smith, nuclear physicist and ex-IAEA Inspector • Questions and answers with nuclear physicist Frédéric Henry-Couannier and Couannier’s message to me • Nuclear Physicist Paul J. Lioy’s analysis of active, beta emitting radionuclides found in the Ground Zero dust • Physicist Heinz Pommers unprecedented analyses (2) of the events of 911 • World renowned nuclear weapons physicist A. Gasponer’s analysis of 3rd & 4th Generation Nuclear weapons • World renowned nuclear weapons physicist Sam Cohen’s critique of the nuclear weapons industry • The analysis by William Tahill of USGS Open Source report #01-0429 in Chapter 1 finding extremely high levels of uranium in the Ground Zero dust • The peer review and public commentary by Dr. Thomas Cahill • The peer review by Dr. David A. Olson • The peer review by Dr. Beverly S. Cohen • The peer review by Dr. James Millette • Dr. Dai Williams analysis of 1st, 2nd and 3rd generation nuclear weapons ... the weight of the evidentiary material and the assertions made herein become unequivocal and unarguable. Here, all roads lead to Rome and on September 11th, 2001, both fusion and fission occurred in Lower Manhattan, New York City, New York. Based on First Responder deaths alone, 1000s of deaths from both multiple myeloma and other rare cancers, we know that many more thousands of New Yorkers and others in the area of Ground Zero working on and around or living near the “pile,” were exposed, for 4 to 5 days at most, to ionizing radiation at a wide variety of external and internal dose levels. After a few short days the radiation had ceased and the city was relatively safe once again except for several persistent spots under the pile that were still hot for 99 more days. Today, 1000s of New Yorkers exposed on 9/11 have died, over 7,500 New Yorkers exposed on 9/11 currently have cancer with 4.17 new cancers related to 9/11 reported every single day. The government's 9/11 registry is following the health of 250,000 people. Using peer review and the work of some of the world's most respected physicists, we prove why this is happening. Excerpt from the Introduction: A clear understanding of the differences between 1st, 2nd, 3rd and 4th generation nuclear weapons is needed and provided along with an explanation of DEW, which actually stands for directed energy nuclear weapons of which we have full knowledge and understanding of, and build and use them regularly across the globe. DEW is a common term in the nuclear weapons industry and does not refer to yet-to-be-developed laser or scaler weapons. DEW commonly refers to nuclear weapons designed specifically to direct their energy to a highly confined soliton — the space assumed by quantum or quasiparticles propagated as a traveling non-dissipative wave that is neither preceded nor followed by another such disturbance — often times X rays and other nuclear effects. The rust that appeared immediately after 9/11, even on nearby new construction, is another important clue. Numerous prominent physicists from Latvia, Germany, France, Lebanon, the USA and many other countries have contributed to this report and their combined work leads to inescapable conclusions. Enough to make the conclusions unassailable and conclusive and I can’t thank them enough. Were it not for William Tahill’s work — the first person in the world to expose and prove fission at Ground Zero — none of this would be possible and I will be forever thankful. All of us should be. I also want to thank Dr. Ed Ward and Don Fox, my silent, behind-the-scenes, cherished and trusted co-conspirator’s. This eMagazine would not have been possible without their dedication as well, along with their contributions towards the physics and chemistry of 9/11. Dr. Heinz Pommer’s contribution is also unmatched, unequivocal and prescient. Pommer was the first to develop an accurate 3-D, Step-By-Step model of the events of 911 and the destruction of the Twin Towers. Dr. Pommer’s work is invaluable and should be disseminated worldwide. To Dr. Frédéric Henry-Couannier, my personal thanks — perhaps we can meet one day! Now we come to Dr. Christopher Busby, physicist extraordinaire. His help, his life’s work and his peer review, as difficult as it may have been to both create and get published, provides insights into the truth behind nuclear weapons, nuclear events, internal versus external dosage and the long-term effects of uranium and other fission products and metals on the planet and humanity. We should all, each of us, be thankful for his life’s dedication to the ongoing global nuclear industries’ continued bioaccumulative contamination of the planet. Dr. Busby’s work is global, on behalf of us all. 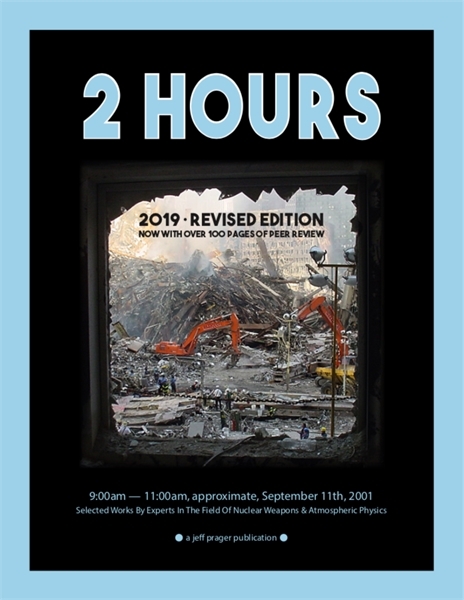 As a result of this well-rounded, well-founded and established scientific assistance, I can state with absolute certainty the following: “The events in NYC on September 11th, 2001 occurring between 9am and 11am — the destruction of the Twin Towers and Buildings 6 and 7 — had both a fission and fusion component to their demolition. No radioactivity after the explosion(s) except from Tritium H-3 which together with He-4 is the product and possibly some short lived gamma radiation from neutron activation products, primarily Ca-45 from the Ca in the concrete and Fe-55 from the steel — most of which would have been absorbed by the iron-rich dust. These would be radioactive for just a few days only and radiation would not have been detectable by most Geiger counters, requiring specialized equipment to detect.” This eMagazine proves this unquestionably.